I’ll admit it. I have no problem doing so. When I’m wrong, I’m wrong. 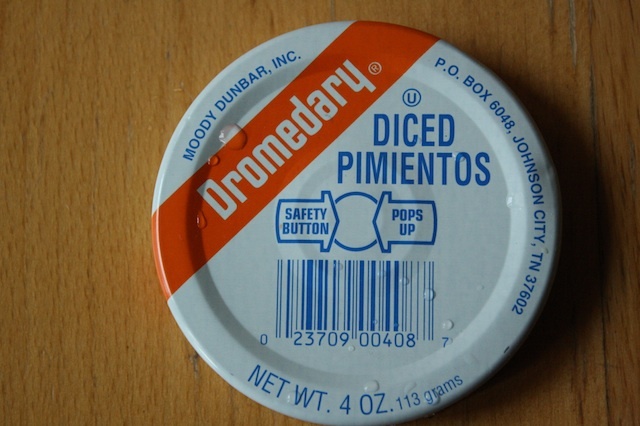 You see, I had some pretty heavy preconceived notions about this Southern thing called “pimento cheese”. Generally not a fan of mayonnaise in great quantities, the thought of mixing shredded cheese and mayo together did not sound tasty. Or delicious. Or possibly good in any way. Friends with Southern backgrounds would swoon at the mere mention but I lumped it into the category of Southern things I don’t really understand, right next to sweet tea and soupy double crust cobblers that are not pie. But that damn cheese is nothing if not persistent – I was in a restaurant just last week that had it on the menu 3 times – as an appetizer spread, topping a burger, and as the key component in grilled cheese. Overkill to be sure, but a clear indication of its beloved power. After crossing paths frequently over the last few years – I swear, it’s everywhere – I started to doubt myself. Maybe there was something to this. So I decided to make it and folks, I was wrong. Holy crap, was I wrong. 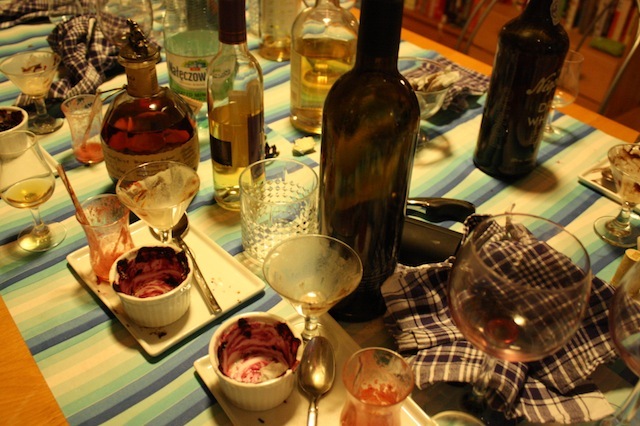 Due to cramped summer schedules, it had been a few months since I last hosted a Sunday Lunch and with my dear friend Hilary hightailing it out of town for warmer climes, I turned the most recent event into a going away party. I told Hilary I’d make anything she wanted for this lunch and she wanted friend chicken. 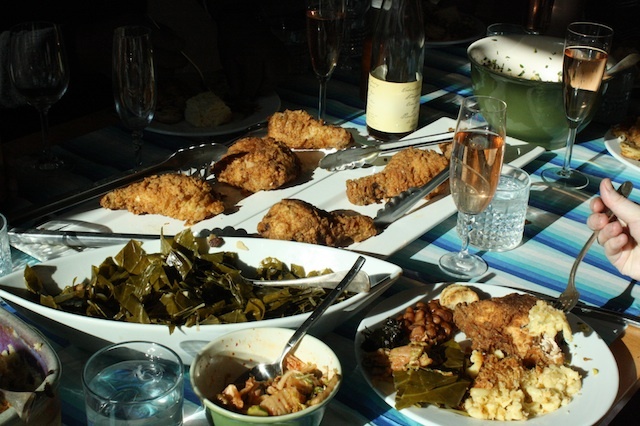 Perfect – I adore fried chicken. I gave the menu a Southern boarding house spin, trotted out all the classics, and put together a menu worthy of Miss Edna Lewis. 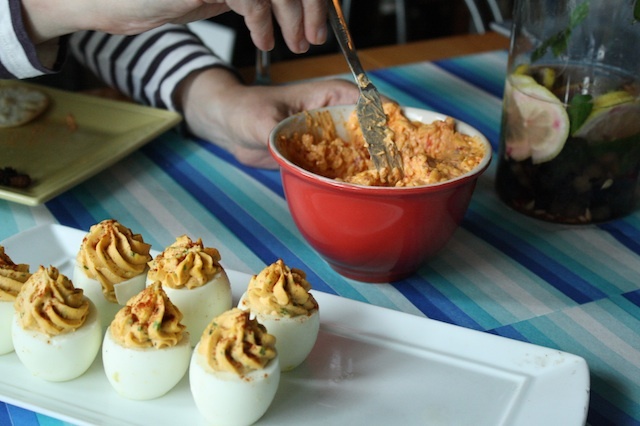 For the opening round, I went classic knowing she likes Deviled Eggs and threw Pimento Cheese in the mix because it sort of matched and sounded easy to make (I’m infamous for overcomplicating things). I wasn’t expecting much and since I don’t particularly care for Deviled Egg’s either, I figured I’d leave these for my guests to enjoy while I was frying chicken in the kitchen. And then I tasted it, piled on a cracker. Huh. Not at all what I was expecting. Creamy, cheesy, a tad bit spicy. It was delicious and I was completely caught off guard. Why had I resisted for so long? It made no sense and given my unhealthy love of bad holiday cheeseballs, I should have taken to this like a duck to water. I blame my resistance on my aversion to mayonnaise. The damn mayonnaise. 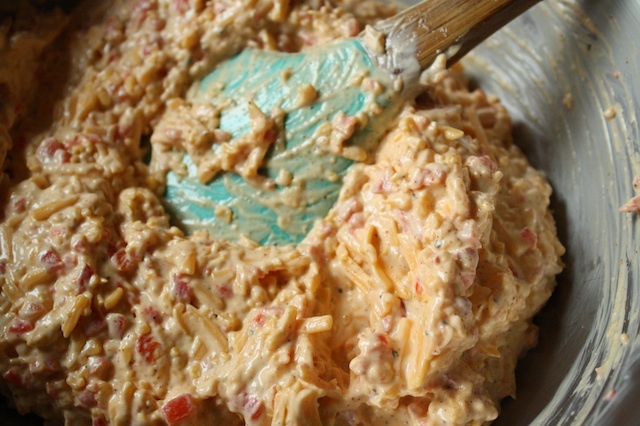 Pimento Cheese has the most unassuming ingredients: cheese and pimentos of course, bound together with mayo and seasoned with cayenne, salt and pepper. It takes 5 minutes start to finish and doesn’t require any special tools beyond a cheese grater. Everyone has one of those, right? The key is regular grocery store sharp cheddar and good mayonnaise, i.e. Hellman’s. Nothing fancy – this is not the place for an aged bandaged cheddar and a homemade mayo, though I bet that would be really really good. And something else entirely. This is ridiculously easy to bring together: shred the cheese, mix in mayonnaise, chopped pimentos (those little red things in jarred green olives) and seasonings. Stir it all together, chill a few hours for best flavor and serve with crackers. Or on a burger. Or inside a grilled cheese sandwich. Or in the middle of a warm biscuit. Or on a spoon. STRESS BAKING THERAPY FACTOR: CRAZY EASY AND CRAZY GOOD. As usual, I’m late to the party. 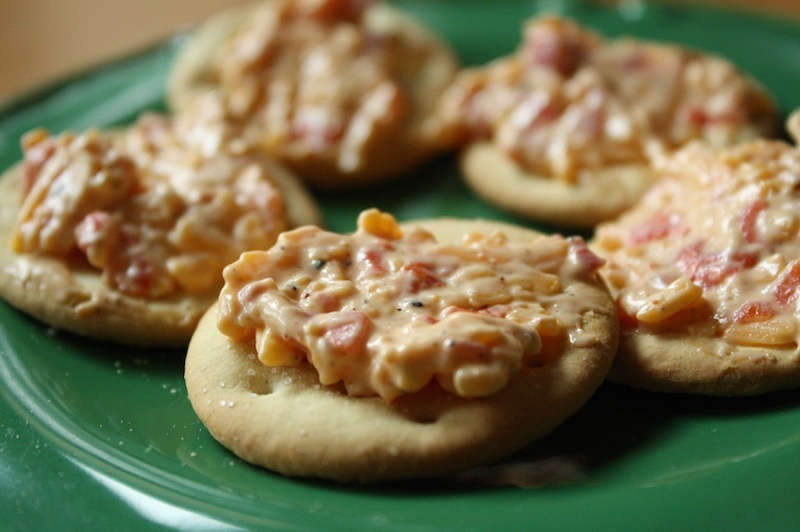 Pimento Cheese has been making the popularity rounds for the last few years but I resisted jumping on the bandwagon. Well, I’m on it now. Better late than never because this recipe surprised the hell out of me. Really. I expected to hate it and discovered I’d eaten a good portion of one batch all by myself. Everytime I’ve served it, people have gone crazy … I’ve made it three times in two weeks. How many really delicious 5 minutes appetizers are in your repertoire? Exactly. This makes a pretty decent amount but it’s never a bad idea to have some extra lying about for a quick snack. I’ve made a ½ batch quite successfully that served 8 as a starter. You can easily make this by hand but I’ve included a food processor version as well which makes a smoother spread dependent upon how much you process the mixture. Hand Method: drain and finely chop the pimentos then add to a medium bowl. To the bowl shred the cheese – I use the large and smaller holes on a box grater as I’ve found the two shred sizes blend better. Add the mayonnaise, cayenne, salt and pepper and stir until well blended. Taste and adjust seasoning if needed. Food Processor Method: Put the drained pimentos in the workbowl of a food processor and pulse a 2-3 times to roughly chop. Remove the blade and switch to the grater attachment. Grate the cheese. Remove the grater blade, place about 1/3 of the grated cheese in a medium bowl and replace the standard chopping blade. Pulse the cheese/pimento mixture several times to break some of the cheese into smaller pieces. Add the cheese/pimento mixture to the bowl with the reserved cheese. Add the mayonnaise, cayenne, salt and round pepper; stir to combine. Taste and adjust seasoning if needed. Serve immediately or store in an airtight container in the refrigerator for up to a week. 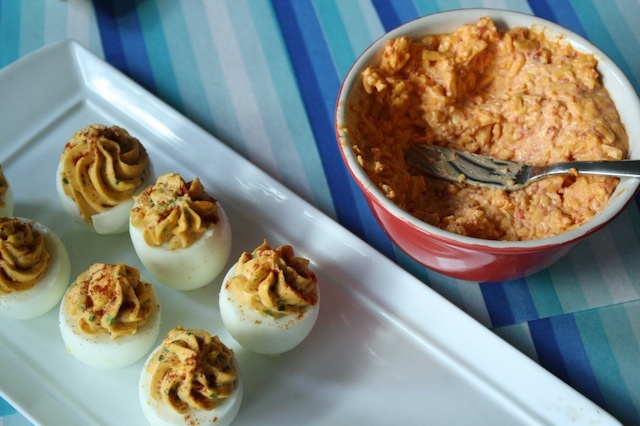 As a Southerner born and bred, one who grew up in a household that always…ALWAYS….had a bowl of pimento cheese in the fridge, I have to say you nailed the recipe….no cream cheese, no horseradish, no extras that distract from the purity of the basics. So good on crackers, in a sandwich, stuffed in celery. My ultimate comfort food! I like pimento cheese but others in my house severely dislike all forms of cheddar and mayonnaise. I think my recipe is similar except I add a pressed clove of garlic. haha! Found the recipe finally.